"Winter" season is tricky here. We might wake up to pretty cool temperatures in the early morning hours, but as soon as the sun has been up for a bit, it heats up the temperature and we have Swedish summer temperatures all through the day. This year it feels as if the cold nights came earlier than usual (or then, my memory is really becoming more foggy so who knows... maybe we're just on target). When you are heading out from the house in the morning you have to take into consideration that you might be sweltering hot in those socks, long pants and warm sweater that felt so cozy at 7 am. Dressing in smart layers is the key. Like not wearing a long sleeved sweater, but rather a top with a hoodie that you can unzip and eventually take off. Or not having a quilted jacket, but a layering wind jacket with a hoodie underneath. I'm so glad Polarn O. Pyret, the Swedish clothings store has opened up their online store in the US. Their stuff is the best - love it! 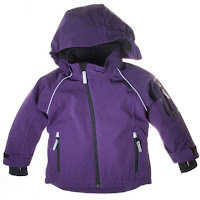 This morning I realized my Daughter's PoP jacket suddenly was too small (she hasn't been wearing it since this summer in Sweden - we haven't exactly had jacket weather here since then and she must have grown two inches since then). I went online and found one and hep - a fig colored, stretch jacket, perfect for layering is on it's way. Hej hej! Tänkte att jag skulle lämna ett litet spår av mig! :D Jag har precis hittat hit till din blogg, kul att få läsa en till svenskas blogg om livet i härborta i staterna! Jag älskar också PoP och blev så glad när jag upptäckte det häromdan! Caroline - hej! Roligt med en till läsare! Kikade in på din blogg - grattis till graviditeten! Visst är det svårt att hitta fina färger på barnkläder - får spatt på fotbollströjor till killar i blått och rosa tröjor till barn... ÄLSKAR att kunna handla på PoP nu!